Subsequent to the passage of the Chesterfield Act, a voluntary federal Registry of SLC-Expressive and Nonexpressive individuals was created. Officially launched on January 1, 2015, these records are maintained by the SLC-Expressive Services Agency and have completely supplanted the previous registry database. Much like driver's license records, entries in the Registry are not available to the public, but may be accessed by law enforcement officials and some government employees in the course of performing their jobs. Although Registration is voluntary, neither SLC-Expressive status nor lack of Registration are legally protected classes at state or federal level. As such, employers may make Registration or SLC status a condition of employment; they may also require a SLC test independently or for confirmation. Similarly, Registration may be mandated in other contexts, such as the requirement that all SLC-Expressive residents of Safe Zones be Registered. Falsifying or altering information in one's Registry record is considered a Class A misdemeanor in New York, and may receive up to a year in jail and a fine of up to $1,000. A repeat offense, or outright counterfeiting of a Registry ID card, is considered a Class D felony and can receive one to seven years in jail. At present, there are no criminal statutes specific to SLC-E abilities in any state. Crimes involving abilities are prosecuted under the most relevant existing statute; for violent crimes in particular, the highest severity of statute is often applied (e.g. "aggravated") and maximum penalty sought. Similarly, using one's ability in self-defense or in defense of another is legally treated much as using a gun would be. The determination of what constitutes "excessive force" in an SLC-E self-defense scenario remains very subjective, however. 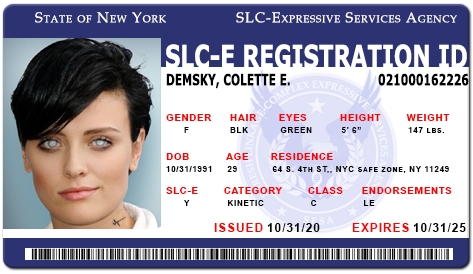 SLC-E individuals convicted of criminal use of their abilities are subject to compulsory Registration. Information gained through perceptive abilities (e.g. postcognition, psychometry) is not at this time considered admissible evidence in any court. Abilities with interrogative applications, such as telepathy, may be used with a warrant, but such warrants are only reluctantly granted by most judges, and evidence thus collected is still considered dubious at best. Registration is carried out at one's local SESA office. The person Registering must bring proof of identity, proof of legal presence in the U.S., and proof of residency. Other data collected include full legal name, birth date, social security number, standard physical stats, and broad information regarding physical or mental impairments. Finally, a photograph is taken. In the case of SLC-Expressive individuals, they must also answer a short series of questions concerning their ability and its scope of effect. This information is used to determine the category and class designations that go on their record. Notably, unlike Registration under the Linderman Act, neither blood test nor demonstration of ability are required. Registered individuals receive a photo ID card confirming their Registered status before leaving the office. Registration must be renewed every five years, and any change of address or legal name must be submitted within 30 days. Similarly, any discovered change in Evolved status or ability class must be updated within 30 days. The Category field contains a very broad type classification of one's SLC ability. Non: Non-expressive. Applies only to SLC-N individuals. Unknown: Given to those who have not manifested, but Register as SLC-Expressive (usually due to a positive blood test). Mental: This category includes all abilities relating to the mind, mental capacity, and perceptions. Examples include telepathy, technopathy, postcognition, clairvoyance, illusions, and so on. Biological: Encompasses all abilities relating to the body, biological processes, and physical capability. Examples include enhanced senses, reactive reflexes, shapeshifting, replication, healing, degeneration, biochemical manipulation, and other similar abilities. Chemical: Abilities that operate on the molecular or atomic scales. Examples include atomic transmutation, molecular conversion, object duplication, object disintegration, and the like. Some energy-related abilities are also often lumped into this category. Kinetic: This category encompasses the directed generation and manipulation of substances or forces, particularly on the macro scale. Examples include photokinesis, hydrokinesis, gravity manipulation, forcefield generation, and electrokinesis. Mimicry powers are included under this heading, as is telekinesis. Spatiotemporal: Includes all abilities relating to the manipulation of or movement through space and time. Examples include stopping time, time travel, teleportation, etc. Meta: Category given to all powers relating to other SLC-E abilities. This includes detection, amplification, negation, absorption, and mimicry of other powers. One's Class is a very general indicator of power scope, based upon who or what can be targeted by the ability. Classes are not exclusive and may be stacked. Class N: Non-Expressive. Applies only to SLC-N individuals. Class U: Unknown. Applies only to unmanifested individuals. Class A: Class A abilities affect the person possessing them. This class includes such things as enhanced physical capabilities, regeneration, shapeshifting, substance mimicry, and perceptive abilities. Class B: Class B abilities have direct effects on other people. Examples include telepathy, projective visions, persuasion, biological manipulation, healing, negation, and so on. Class C: Class C abilities affect the surrounding environment and/or things that are not other people. Examples include animal telepathy, telekinesis, photokinesis, weather manipulation, technopathy, etc. Endorsements are notes that represent particular authorizations or restrictions the Registered person has. Authorization endorsements may be required for certain jobs or activities, and obtaining one requires meeting a given standard of training, capability, and control as demonstrated to an appropriate SESA representative. Restrictions are typically placed as consequences of criminal sentencing. COM: Commercial. Someone with the COM endorsement is authorized to use a Class B or C ability in a commercial or industrial context and to receive compensation for its use. Requires evidence of formal training and experience adequate to intended use and public safety considerations, along with passing a brief practical exam. Must be 18 or older. Commercial endorsements are typically required for employment or self-employment in positions where a Class B or C ability is used routinely on the job, such as telekinesis in construction. They do not apply to abilities that are strictly Class A. Because a COM endorsement is evidence of being trained to a higher safety standard, it is often regarded positively by insurance companies, prospective employers, and clients even when not required. As the Registry is still relatively new and certified instructors are few, applicants for a COM endorsement may bypass the training requirement if they instead pass an intensive practical exam demonstrating their control and capability. This alternate test-based process is set to be phased out by the end of 2018. LE: Law Enforcement. Someone with the LE endorsement is authorized to use their ability in a law-enforcement capacity, such as using a kinetic ability on SWAT operations or interrogation via telepathy (with appropriate warrant). Requires evidence of formal training and passing both a written exam and an intensive practical exam. Must be 18 or older and employed in a law enforcement role. This endorsement is required for essentially all SLC-E employees in active law enforcement roles, and is revoked when that employment is terminated. LE is considered a higher standard than a COM endorsement; thus a secondary COM endorsement is not required, and upon exiting a law enforcement job the authorization can typically be converted down with minimal bureaucracy. MIL: Military. Someone with the MIL endorsement is authorized to use their ability in military applications. Applicants must provide affirmation from their military superiors or contracting entity regarding their training and capability, along with passing a written exam and intensive practical exam. Must be 18 or older and either active duty military or a government contractor with military-related operations in their contract (including military engineers in hostile locations). MIL is considered a higher standard than a COM endorsement; thus a secondary COM endorsement is not required, and upon exiting active service the authorization can typically be converted down with minimal bureaucracy. Those on inactive reserve do not retain the MIL endorsement and must renew it if called up. INST: Instructor. Someone with the INST endorsement is authorized to instruct others in ability use and to attest their students for any endorsement they themselves possess (i.e. providing evidence of their expertise). Requires a COM endorsement and passing a practical exam. Attesting for an INST endorsement requires the instructor have held their own for at least two years. Nonexpressive and Class A Expressive individuals may obtain an INST endorsement in the absence of a prior COM authorization by passing intensive written and oral exams on the theory of ability use and training. The INST endorsement is not strictly necessary for positions such as teaching children, academic positions, or private mentoring, although employers and clients may require it at their own discretion. It is often required for advisory positions (e.g. an LE consultant regarding SLC-E individuals) because it implies greater knowledge about abilities and how they work. The INST endorsement is required for organizational training positions such as military, police, or SESA instructors. RES: Restricted. The RES restriction indicates someone who has restrictions imposed by law enforcement on the use of their powers. It is typically applied to people on parole, and may be part of the sentence in some convictions. The Registry card does not itself contain specific information about the restrictions, but accessing their record brings up reference to a more detailed database entry. NEG: Negated. The NEG restriction indicates someone who has been sentenced to chemical negation. As with RES, further details are available through the Registry database.